What our clients have to say about Pawtropolis. I just wanted to thank Kathie and Billie Rae for the awesome puppy class. Bear is really learning a lot, and I am, too. As a first-time dog owner, this class is a TREMENDOUS help, and I really appreciate you both being so knowledgeable, encouraging, and helpful. Bear started making eye contact a lot more, and I think it's due to your suggestion for me to make sure I have a cheerful expression on my face, so thank you! Our little Scottie, Jock, had his first daycare day at Pawtropolis yesterday. It was great! He played and had a really good time. Everyone there was wonderful! We watched him on webcam. It made me miss him but it was such a nice option. He has taken a puppy class at Pawtropolis and it was great too. Pawtropolis is just a terrific place. Thank you for taking such good care of our boy!! I wanted to send a quick thank you note, for taking such good care of my boys (Jasper & Enzo) while my husband and I were out of town! My husband and I are both graduate students and have previously chosen to leave our pups with friends (the free, or nearly-free option). This time, we decided to try your Stay-and-Play boarding option. We were already big fans of daycare and the boarding experience was even more impressive! We could tell that the boys had a great time playing with all the daycare pups!! Every once in a while we'd check the web cams to find them busy wrestling, or perched on top of the bridge for a better view! :) The Pawtropolis staff are wonderful!! Whenever we called to check on Jasper & Enzo, they always took the time to give us a little update on how they were doing! 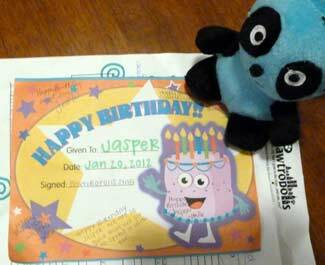 It was Jasper's 2nd birthday the weekend we were away and when I unpacked the bag of food and bedding that we sent with them for the weekend, I found a very sweet birthday card, signed by staff members and new toy (an adorable, squeaky panda toy)!! It's these little, "above and beyond" gestures,treats,report cards,etc. that make Pawtropolis such an incredible place! A place that pets and their owners look forward to visiting!! Thank you, for all you do!!! I just wanted to say thank you! We moved to Athens from Indiana in August 2011 where our dog, Bailey, went to doggie daycare 3 to 4 times a week and loved it. Our biggest concern was that we would not be able to find something similar here in Athens. But, then we found you. Bailey, who has endless amounts of energy (yes, we still throw the ball for an hour after he is with you for the day), is now our happy dog again. I know Bailey loves it there because he starts to whine and get excited as we come down the road. We cannot begin to express our appreciation for everything you have done for our pup, Juno. We loved reading her report cards every time we picked her up and loved how you made us feel like our dog was so special to you guys. We will truly miss everything you have done for us and can only hope that we can find a place that will care for our dog as you have. We loved finding the sweet picture of her in her bag when we picked her up after her last stay (did we miss her as a featured guest?). Thank you so much, we will miss you all! Many thanks for taking wonderful care of my cats during an extended Spring stay 2011- my second year in a row in which my complete trust and confidence in your care of Leo and Rose as well your generosity and kindness in granting me a discount on a long term stay allowed me to go overseas. Last year I was in France and this year as I experienced the cultures of Czech Republic and Hungary I had no worries about my cats. I would never have been able to do this without you as there is no where else I would consider leaving my cats for that long. For any clients who need to take longer trips you can be confident that your cats would be in great hands with Pawtropolis. I can attest to that as I've been in this position twice. Kitty City is a cutting edge concept in cat boarding. 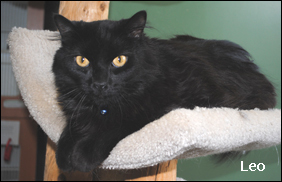 Your cats will not be miserable or bored here and you won't feel guilty leaving them for a long stay, as this is an open facility in which during the day your cats are not in their cages. They mingle together as Kitty City has numerous shelves which cats love to climb so that each cat can find his own spot as he/she chooses and as this is my 4th time in total boarding at Kitty City I can truly confirm that they all get along very nicely. My cats love it. Rose especially loves the really high shelves and the comfy night time bedding in her cage(its hard to get her up in the morning), and Leo, who is normally shy and not at all social with other cats, loves hanging out in the room, especially on the climbing tower in the middle, watching the other cats. My cats always come back from Kitty City in the best of spirits. I have had a lot of experience boarding them throughout their lives and Kitty City is the ONLY place I have found so far that they actually enjoy. Also, if you are very busy preparing for your trip or exhausted on the return from your trip I highly recommend Kitty City's Pet Taxi....it is reasonably priced and very convenient. Thanks again Pawtropolis for going above and beyond my expectations. Thank you so much for taking such good care of Coaleigh today. She looks gorgeous and has been so pleased with herself all night long (she smells MUCH better too)! It meant a lot to me that you listened to my concerns and gladly show me the facility. After years of being afraid to board her and have her groomed (after a bad experience at another place), I will confidently keep bringing her to you guys! Thanks again! Thank you to Pawtropolis, particularly to Dave Spring, Jessica Watkins, and Alison Wilbanks for helping me and my dog settle in to our new life together. Sully may still be a stubborn boy at times, but he seems happier and more relaxed every day. I certainly can tell a big difference in the before (June 2010) and after (October 2010) photos that Sully has come a long way. Thanks for the info. I am so happy we have you and Pawtropolis in our community! We are lucky! You have done an AWESOME JOB with your business!!! Thank you to you and your staff for taking such fantastic care of Leo and Rose. Your kindness and generosity with the discount made it possible for me to make the best decision for them which was your place and not be so worried about them with me being gone for so long. The cats are very happy. I have boarded Leo in the past at other places and he has always come back miserable. But not so with your facility. Both cats were so relaxed when I picked them up. Leo immediatley recognized my voice when I went in to the room and stayed in my arms for 5 minutes when I picked him up. Rose had such a good time she did not want to leave the place. Leo who has always been shy seems to have a new found confidence and mellowness. I think being around the other cats and having to share made him more confident in a group and less aggressive towards Rose. Next time I travel I will definitely bring them back to you. This could be late August or September for a week. Hello, my name is Courtney Fisher. 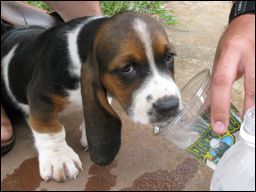 I have been bringing Presley (the small basset hound) to Pawtropolis since she was just a few months old. She and I have been so incredibly happy and pleased with Pawtropolis. We both love and get excited when we drop her off for daycare. I know your staff is incredible and my "child" is in great hands all day! thank you so much for everything you and your staff do for us and all of the other families you serve. Thank you so much for taking care of Raleigh over the past two years during times while I was away. I know he loved being in Kitty City playing with all the other cats. We will both miss you when we leave Athens but will keep you in our thoughts. I support Amanda in her service to companion animals. We must advocate and network for our furry friends. They can’t use the internet!! I still love receiving things from all of you, even though we moved to Florida 5 years ago. There is no place like Pawtropolis here on Amelia Island. When we move back to Georgia, we’ll be able to transport dogs and volunteer. We can’t wait! Keep up the good works. Pawtropolis has an outstanding staff that know you when you call or walk in the door. Even if you don't have your pet with you. That is excellent customer service. Jessica and Amanda G always make me feel so welcome whether I am calling with a question or bringing Gidget and Gizmo in. They always ask about Gidget and Gizmo too. When my dogs do stay I am completely trusting in the care they will get as well as the fun they will have. Thank goodness Amanda Rodriguez had the vision to open and run Pawtropolis. We are all very lucky. Her expertise in dog behavior, training and nutrition are priceless. If I ever have questions or concerns regarding my dog I think to call on her or my vet. Most people only have their vet or books to rely on. Finally the classes available at Pawtropolis are fabulous. I have participated in classes in the past and hope to do so again in the future. which is saying a lot considering he is so spoiled! It's so hard finding a great boarding facility for cats; most places just put them in a crate and leave them for the majority of their stays. I'm so glad I found a place that lets him do his own thing. This was not Raleigh's first time in Kitty City and it definitely wont be the last! Thanks again! This is part of why we love Pawtropolis! You always go the extra mile, Amanda, and I'm sure the rest of your clients would agree with me. Hi Amanda, we've been bringing our 2 dogs, Brownie and Whitey, to Pawtropolis for the last few years and just love it. Unfortunately we recently moved to Atlanta and even with all of the options we're having trouble finding a place we like for boarding with daycare. Do you happen to have any recommendations in Atlanta? The more similar to Pawtropolis the better! For long trips we may end up driving back to Pawtropolis, but it would be nice to have somewhere in Atlanta we'd be comfortable using for weekends etc., and we'd love your recommendations. Thanks so much, and we didn't know how good we had it at Pawtropolis! You have a fantastic facility! "As a new pet owner and a poor college student, I'm stuck between two very difficult worlds - getting everything I think my puppy needs and staying within a meager budget. What's a new pet owner to do? After much research, I stumbled upon a place that was set in Bogart, Georgia called "Pawtropolis." This place: Pawtropolis, Neighborhood: Bogart, Athens, GA 30622, United States of America had it all! Grooming, training, boarding, and day care! All at a reasonable price!" "Pawtropolis is THE place to take your dogs and cats for boarding while you're on vacation, or for babysitting while you're at work..."
A big "THANK YOU" to our clients. Owner Amanda still pinches herself occasionally. She still can't believe she started Pawtropolis by doing pet sitting in her rental apartment during college. Now she's celebrating the opening of her second location. At first the Athens' community thought the idea of "doggie daycare" was a bit crazy. It didn't take everyone long to see the benefits. Athens has embraced Pawtropolis over the years. Amanda keeps the highest standards and hopes never to let her community down. She comments frequently about how blessed she feels by the support of all of her clients. 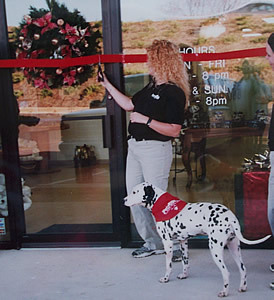 The picture below was taken at the ribbon cutting of the first Pawtropolis, December 1, 2001. Boy how far we've come!